No. 4 seed Dimitrij OVTCHAROV clinched the fifth title at the CCB Europe Top 16 Cup Montreux. In the final he overcame Vladimir SAMSONOV of Belarus (6:11, 11:8, 11:3, 14:16, 6:11, 11:7, 12:10). In the action roller-coaster power shifted from one side to another and until the last ball the game was open. Before 2019’s final SAMSONOV and OVTCHAROV both had four titles in their record books and shared third position in the overall standings behind legendary Swede Jan OWE WALDNER and Timo BOLL with seven and six. Now OVTCHAROV took the third spot. Four-time Europe Top 16 Cup winner, Vladimir SAMSONOV played for a 22nd time at the event. Belarus legend started his journey through the Euro Top 16 cups in the French city of Dijon, 24 years ago, as the youngest participant, sharing fifth spot with current Dima’s coach Jorg ROSSKOPF from Germany. The duel for the spot no. 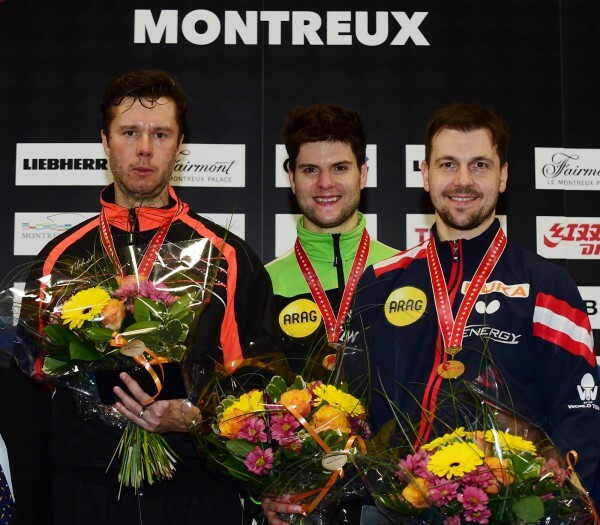 three at the CCB Europe Top 16 Cup Montreux concluded with the win for Germany’s Timo BOLL against Daniel HABESOHN of Austria (11:7, 11:4, 7:11, 9:11, 3:11, 12:10, 11:5). Six times winner at Top 16 and Top 12, was stretched to full seven games in the last match before he prevailed. “I had some advantage by finished my semi final match hour or two before Daniel. Also, I was mentally stronger today,” said BOLL.